Windows Theme Customization packs are popular these days, few days earlier we posted Windows 7 theme pack, You must have got bored by that look now, so here we have another cool Ubuntu theme pack for windows XP, once again from the artist's at DevianArt doing a marvelous job of providing us fresh new customization packs for Windows. 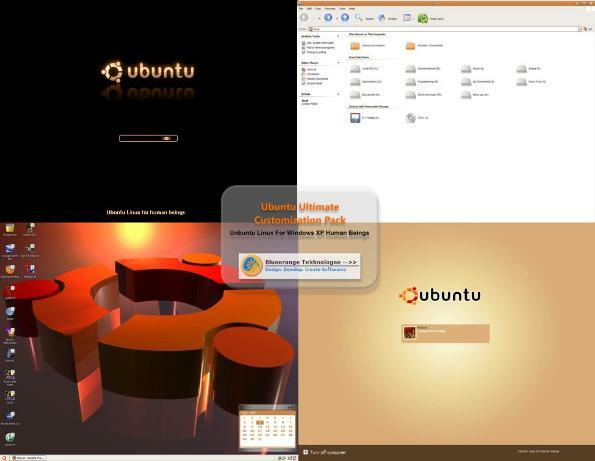 The Ubuntu customization pack contains various component packs including visual styles, Icons, Boot Screen, Cursors, Logon UI, Wallpapers, Screensaver, ubuntu sounds, Clock, 3D Desktop manager and much more for the perfect Ubuntu feel on your windows XP desktop. Extract all files/folders from the zip. Follow instructions provided in "How To Use.txt"
"Outstanding?," you ask. Yes, outstanding. This is pack is the perfect complement for anyone using seemless mode with a WindowsXP VirtualBox. Thank you to whomever gathered all the resources and features in this pack. I am using this on two computers and all works fine, what problem are you facing ? I installed KDE-XP and Mac-Look on my Mandriva Linux Free, because I want to feel like I use WinXP and Mac but I can't afford to buy them. But this??? If you want to feel like you use Ubuntu, why don't you just use Ubuntu (C'mon man, it's free of charge!)? does it works on vista by any chance?probably no. go @t http://www.alienware.com for alienware kickass theme for XP. totally WICKED & WHAT ELSE EVER U SAY! Dig your style brother.... NOOB for life! my desktop almost looks like ubuntu except for the panel where u click at turn of computer in start menu and it shows standby-turn off-restart...just dis part remain in blue...anyone know how to fix it? Aqui no meu pais uso windows por obrigaçao ja que internet via radio ainda nao e compativel com ubuntu, agradeço e um alivio para meus olhos! Translating: Here in my country, I forced to use windows 'cause the wireless internet still don't works in Ubuntu. Thanks, it's an appraise to my eyes. its Cool beautiful and complete theme for XP. can you upload it to mediafire? Ubuntu is a open source, free download and can be run on a computer with Xp or vista, etc. In most aspects, Ubuntu is allot better than xp so what is the point of getting a theme of a good software for a bad software when the good software is free? can it support xp sp3 ?? Really good. It iz better than Windows 07 theme !! !